This analysis shows how, among high-consuming populations, the three diet shifts could significantly reduce per person agricultural land use and greenhouse gas emissions. From these results, we found that the agricultural land use and greenhouse gas emissions associated with the average American diet in 2009 were nearly double those associated with the average world diet, with 80 to 90 percent of the impacts from consumption of animal-based foods. 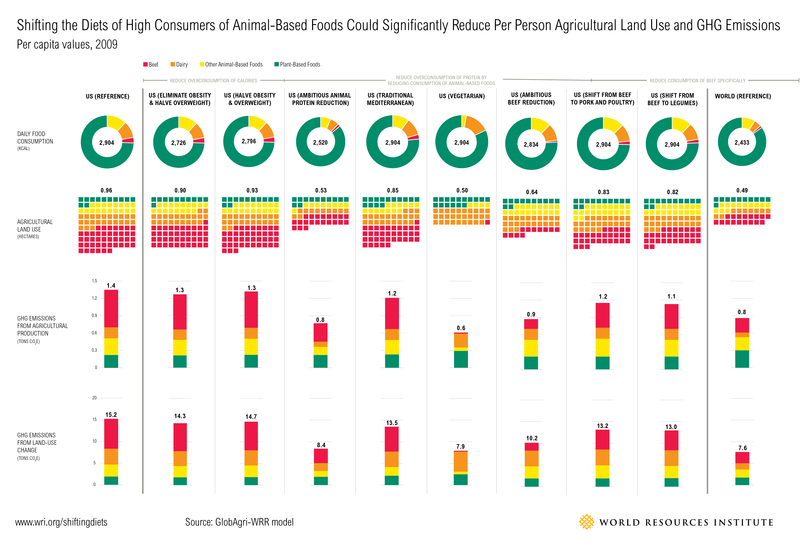 Shifting the diets of high consumers of animal-based foods could significantly reduce per person agricultural land use and greenhouse gas emissions, and reducing animal-based food consumption results in significant savings in global agricultural land use. Lastly, all three diet shifts could contribute to a sustainable food future, but the two shifts that reduce consumption of animal-based foods result in the largest land use and greenhouse gas reductions. Note: All "US" data are for United States and Canada. Land-use change emissions are amortized over a period of 20 years and then shown as annual impacts. Calculations assume global average efficiencies (calories produced per hectare or per ton of CO2e emitted) for all food types. “Other animal-based foods” includes pork, poultry, eggs, fish (aquatic animals), sheep, and goat.